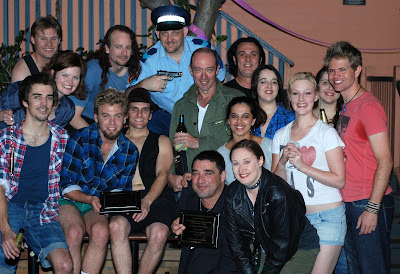 This is the cast of The Tasmanian Babes Fiasco after our closing night's performance on Saturday 15 May. With them is the book's author, John Birmingham, and the playwright, Simon Bedak - both extraordinarily kind and generous gentlemen whom I remain indebted to. I'd like to write a longer, more reflective piece about the show and all the challenges and joys it brought - but it may have to wait until I've had a teensy bit more sleep. 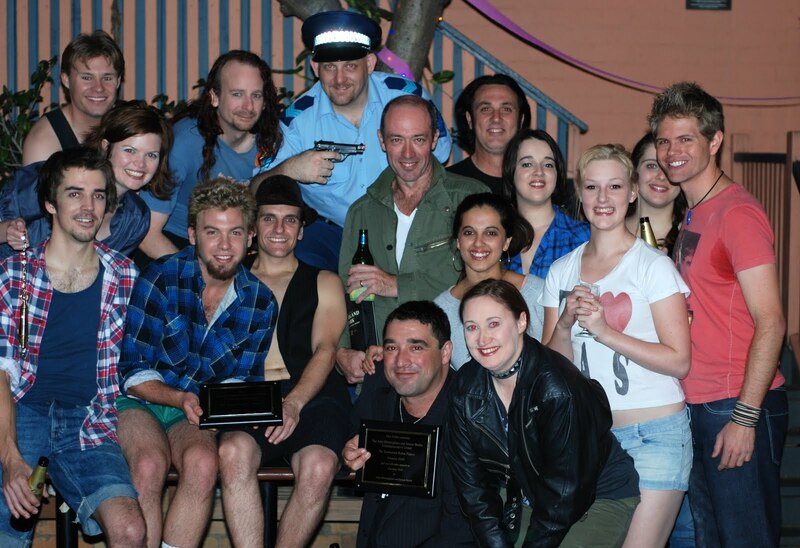 But I did want to express my dearest thanks to everyone who came along to see Tassie Babes. Your support and enthusiasm is a balm to the creative soul, and means so much to people who do all of this stuff for the sheer love of it. Thank you all so much. I also wanted to share a few more photos with you. First up, the most glorious final-night surprise for me as director - a cameo by John Birmingham at the start of Act Two. As I understand, he and Simon had gone down to chat to the cast at interval, where the plot was hatched. I was told something had been changed, but had no idea what. When I gazed down at the stalls from my spot in the balcony and saw JB's seat in the front row was empty, I quickly got my camera ready just in case. And well I did! 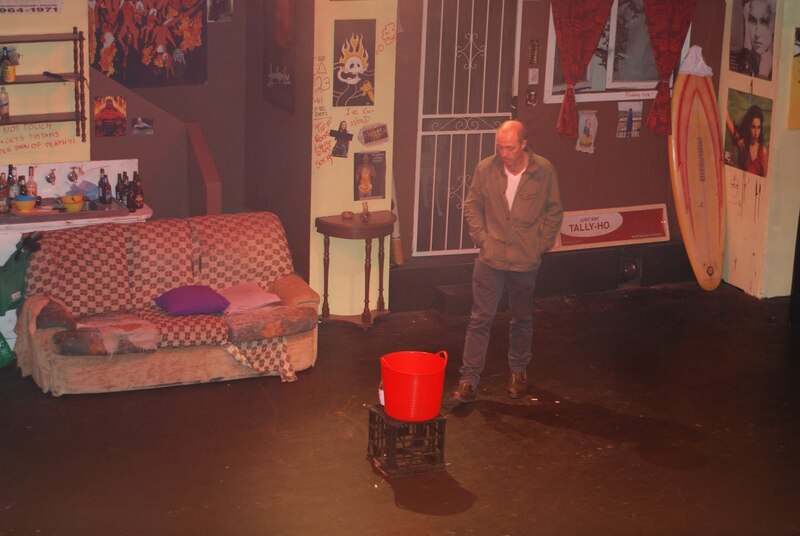 JB strolled out through the screen door, examined our red cocktail bucket, then grabbed a bong, lit up, took a drag, then strolled downstage, down the stairs and back to his seat. It was simply brilliant. 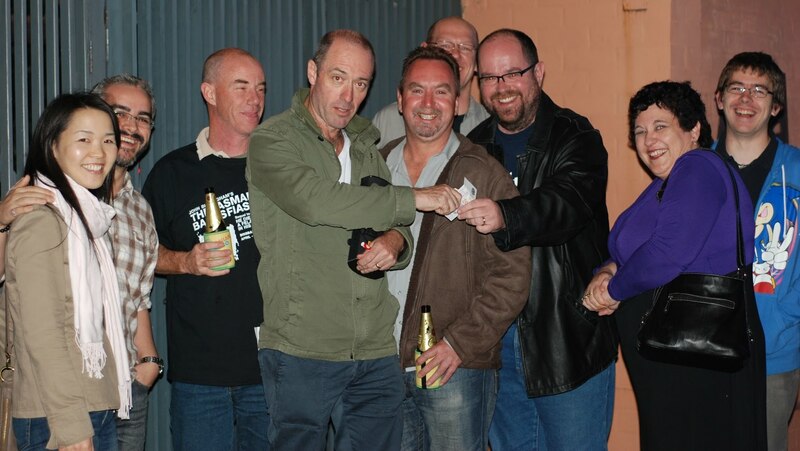 And finally, I was able to snap a photo of the dedicated Burgers who came to closing night - even some from as far as Melbourne and Canberra! These guys have been so supportive and positive - I'm so pleased they had a great time. 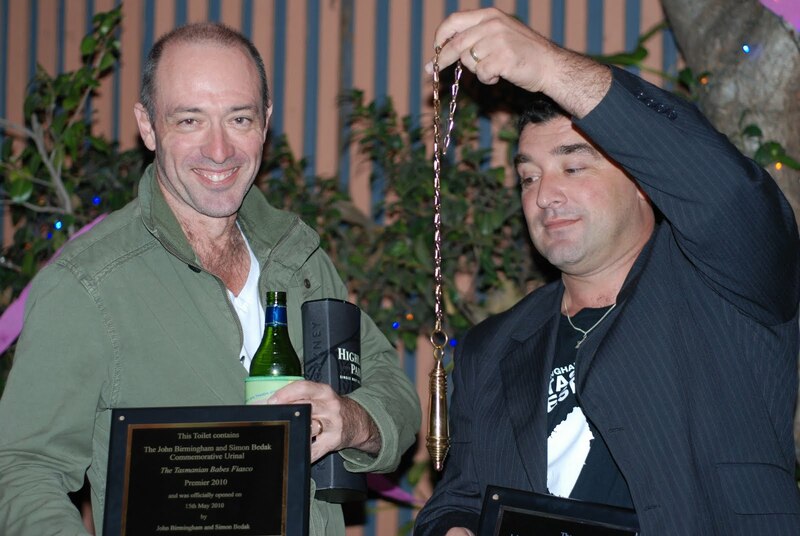 In this picture, you can actually see JB handing Mr Abe Frellman (the Sausage King from Queanbeyean) ten dollars. This was because Abe won a bet back at the end of last year - I believe it had something to do with the timing of Malcolm Turnbull's rolling as Liberal leader. I'm pleased that Tassie Babes could be the place where finally, the bet was settled. Thanks again to all. I have many more photos - and video taped by a cast member! - I'd like to share, so hopefully in coming days I'll do that. We Burgers on the other side of the world wish we could have been there, too. John's cameo, as you describe it, is cool beyond words. Great pics GC, and an AWSM night. Thank you. "Put a ring on it" and "The teddy bears picnic" musical numbers were really sweet. Had a big time, and we all enjoyed it. Which I gather may well be on the cards???? ?